The Boys in Green beat Bosnia earlier this week to secure their spot in France. Republic of Ireland manager Martin O'Neill (right) and assistant manager Roy Keane celebrate after the UEFA Euro 2016 Qualifying Playoff second leg at the Aviva Stadium. FOR THE SECOND time in a month last Monday, the Aviva Stadium was rocking. Ireland had beaten Bosnia and secured their place at the Euros next summer — a task that looked impossible following the side’s 1-1 draw with Scotland at the same venue less than six months ago, a result which left the crowd demoralised and the team’s qualification hopes hanging by a thread. The Germany match was the first time the Irish team had won a competitive home game against a team ranked above them (with the exception of a forgettable 1-0 victory over Slovakia in 2007) since the memorable 1-0 win over Holland in 2001 — the Bosnia victory was the second. These two more recent games were also probably the loudest an Irish stadium has cheered since that fateful 2002 World Cup qualifier, which the youngest members of the current squad are barely old enough to remember. Arguably, the feel-good factor that was once irrevocably associated with the Irish team has also been missing in the intervening years between the famous Dutch and German performances. The barren spell that followed the Mick McCarthy era saw Ireland fail to capitalise on major tournament qualification opportunities with both Brian Kerr and Steve Staunton at the helm. Giovanni Trapattoni eventually emulated the feats of McCarthy and Jack Charlton by overseeing Ireland’s progress, but Euro 2012 turned out to be the antithesis of the euphoric, incident-filled previous tournament adventures. Even at Trapattoni’s height, the Irish team were hardly as universally loved as they were in the days of Charlton and — to a lesser extent — McCarthy. Yes, people got behind the side after qualifying for the Euros, but many still expressed reservations about the more cerebral, defence-oriented and quite frankly, negative style of football that the Italian favoured. The qualification itself under Trap was an anti-climax — a 1-1 draw at the Aviva Stadium against a distinctly ordinary Estonia side, having effectively wrapped up the tie with a 4-0 win in the first-leg in Tallinn. Richard Dunne’s defensive masterclass against Russia in Moscow notwithstanding, the Irish team’s campaign had been invariably low both on quality and excitement. The Euros themselves, to put it bluntly, were an unwatchable nightmare from the Boys in Green’s perspective. History could repeat itself, of course, but you get the sense that O’Neill and his deeply committed group of players won’t let it happen this time — and not just because a 24-team tournament is bound to make life easier for Ireland in the early stages at least. Since the 63-year-old coach has taken over, some similarities remain. The Irish side are still not averse to the odd dire display, such as the 2-1 defeat in Warsaw against Poland last month. The team still tend to be quite goal-shy — last Monday’s game was the first time the Boys in Green had scored twice in a competitive fixture, excluding matches against Gibraltar, since 7 September 2014. And of course, the style of football remains overly reliant on the long-ball game. Yet O’Neill is far more daring in his approach compared with Trap. Not many Ireland managers would be brave enough to start with four attacking players — Jon Walters, Wes Hoolahan, Daryl Murphy and Robbie Brady — against the reigning world champions. Nor would Trap have encouraged his team to attack so aggressively, with a 0-0 outcome good enough to progress, as the Irish team did for a sustained period last Monday, until they deservedly claimed the opening goal (even if the penalty itself wasn’t deserved). There is consequently more than a slight resemblance to O’Neill’s old Celtic side in the current Irish squad. Like that team, the Boys in Green collectively are far greater than the sum of their parts. At Celtic, O’Neill masterminded home wins over better sides than the Scottish outfit, such as Liverpool, Barcelona and Juventus. Like Ireland, despite their technical limitations, they never feared their feted opponents, particularly in home matches. And in addition to rarely losing home Champions League games under O’Neill, they also went a record 77 home fixtures unbeaten in the SPL between 2001 and 2004. Similarly, Ireland have yet to lose a competitive home game under the Derry native, and they play with a similarly high tempo and work-rate to that Celtic side, forging a close-knit club-like mentality in the process and getting the crowd on their feet through the players’ sheer energy and honesty of effort more than anything else. It’s also helps to have a hero, and while not quite Henrik Larsson, Jon Walters confirmed his status as the Irish squad’s most beloved player with a brace against Bosnia. With Richard Dunne and Damien Duff retiring, and Robbie Keane and Shay Given past their prime, the Irish team were crying out for a figure that the crowd could idolise. At 32, Walters may have been an unlikely candidate, but he is a perfect symbol for the team at large — yes, his talent is limited, but in terms of wit, passion and work ethic, few other current internationals can match the defiantly old-fashioned and consistently effective Stoke forward. 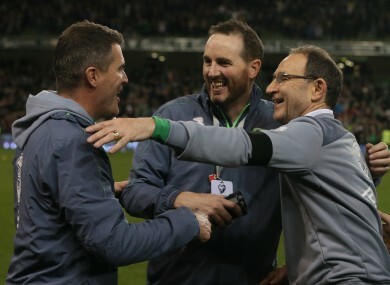 Email “O'Neill's greatest feat isn't getting Ireland to the Euros -- it's making people love the team again”. Feedback on “O'Neill's greatest feat isn't getting Ireland to the Euros -- it's making people love the team again”.